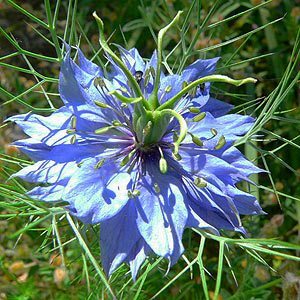 Nigella or ‘Love in A Mist’ is not a plant named after a chef, but is is an attractive cottage garden plant, although the seeds of Nigella Sativa are used in cooking. Nigella damascena is the well known ‘Love in a Mist’ and is certainly a most attractive addition to the perennial border. Widely used in cottage gardens where it is happily allowed to self seed. The ferny foliage and delicate flowers combine to create a lovely tangles mist of flower and foliage. 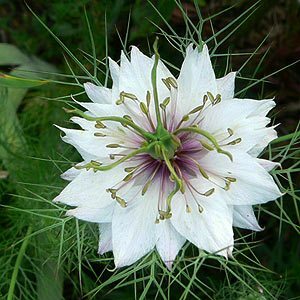 Regarded as an old fashioned annual flower Nigella or ‘love in a mist’ do have wonderful feathery foliage and delicate white, blue or pastel flowers circled by fine hair – like bracts. The seeds of Nigella sativa are used in middle eastern cooking (bread and cakes). Seed heads can be dried and used for decoration. A well drained humus rich soil and sun to part shade. Sow from seed, spring to early summer. Seeds are best sown directly as this is one of those plants that seems to resent being transplanted. Best sown close to the surface and watered or kept moist with a liquid seaweed fertilizer. You can deadhead to encourage a second flush of flowers, that is if you not wish to collect seed or let the plants self seed.